I created this image for a demo I did for a small group I belong to. We have our own “book club” using Craft Stamper Magazine, and meet monthly to share projects we’ve made from the current month’s issue. 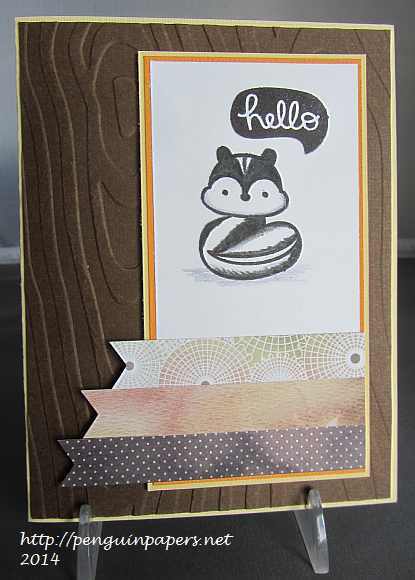 This stamp is meant to be a chipmunk, but this project “skunkified” the chipmunk and gave it a whole new look! I used colored pencil to fill in the black spaces and add a stripe down his head. The sketch is the current one at Operation Write Home (OWH) Stars and Stamps, Sketch #226. I created a wood-look background with the embossing folder to make the skunk feel more at home. Thanks for visiting. This entry was posted on Monday, May 26th, 2014 at 12:22 pm	and tagged with cardmaking, cuttlebug, embossing, fauna, lawn fawn, stamping and posted in Challenges, General Cards. You can follow any responses to this entry through the RSS 2.0 feed. Neat card, pretty cover way of changing th stamp. Oh my gosh how clever is this! Love how you turned a chipmunk into a skunk…!